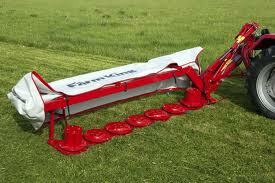 Farm King is proud to introduce new Disc Mowers to the cutting team. they are constructed using only the highest-grade steel and gear components. Cutting discs and blades are easily accessible by removing six bolts and the sturdy cover to reveal the inner workings of each disc assembly. 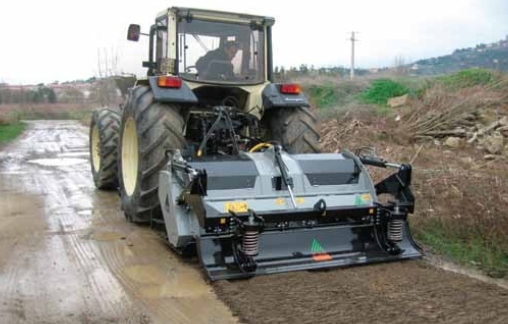 Tractors ranging in horsepower from 40 to 50 can operate the exclusive mower sizes with ease. Two cone discs ore located on each end of the disc assembly to assist in swath formation and shaping. Transportation is effortless with the help of a single acting hydraulic cylinder that maneuvers the mower precisely in a matter of seconds. While in transport mode, the automatic locking mechanism provides piece of mind while en route to the field. 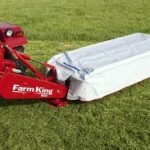 Simply pull on the rope located near the 3-pt hitch assembly and the locking mechanism is deactivated to lower the mower into position. They come standard with 15-inch discs and 4-inch long blades. The free-swinging blades create a precise cut when reaching rotation speeds of 3000 rpm. 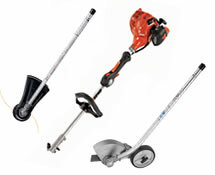 the centrifugal force creates a vacuuming effect on the blades of grass and allow for a nicely manicured look. A 3-inch blade overlap ensures a clean cut every time. 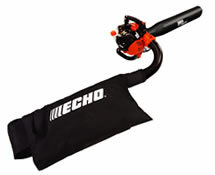 While mowing one lever lifts and lowers the whole mechanism making operation quick and easy.